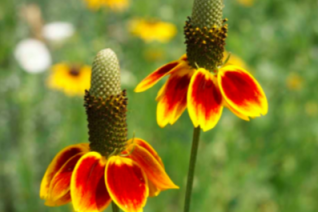 Mexican Hats are iconic flowers of the southwest american prairies. Slender plants that rise up to 2′ feet with adorable flowers, red petals reflexed around a black prominent cone. The red petals are mostly outlined in yellow. Forgiving wildflower for full sun any well drained soil with regular summer water. Remove spent flowers to spur more- this will keep it in continuous bloom. Cute cut flower and the little flowers really do look like sombreros. Winter deciduous. Will often self sow in open disturbed soils. The biggest black eyed susan daisy of them all. 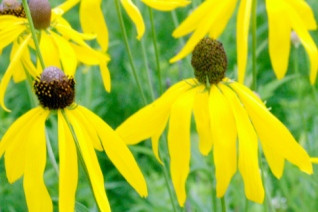 Towering to 7’+ the sturdy straight stems of this hardy American plains native perennial displays very large yellow flowers with drooping petals reflexed away from a prominent black central cone. The thick stems rise up from a low mound of foliage. Blooms all summer long and often into October. Loved by pollinators of all kinds it also makes a really cool and surprisingly long lasting cut flower. Put this beauty in the back of a border where its sunny yellow flowers can wave to the sky. Light summer water in any well drained soil. Full sun to avoid flopping.